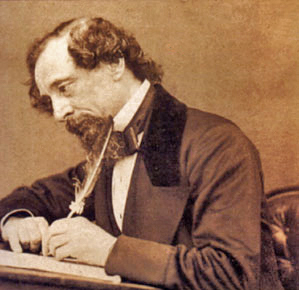 In some ways, it is extremely difficult to pin down what makes Charles Dickens (1812-1870) a great writer. With a career than ran from 1836 to 1870, from Sketches by Boz to the unfinished novel The Mystery of Edwin Drood , Dickens is the acknowledged master of the Victorian novel, sometimes considered second only to Shakespeare among the ranks of English language authors. But what makes him great? Why did he transcend his own century and find his way into so many aspects of contemporary popular culture? First of all, we might acknowledge his tendency to rely on coincidence. For instance, Oliver Twist  ends entirely too neatly (but we wouldn't dream of giving it away). Also, Dickens' more sentimental aspects have not aged well. Of The Old Curiosity Shop, Oscar Wilde quipped, 'One would have to have a heart of stone to read the death of little Nell without dissolving into tears…of laughter.' Dickens also has an unfortunate tendency to write very good, very beautiful, very dull heroines: Agnes in David Copperfield or Ada in Bleak House , for example. He could also paint a scene like no one else: the fog at the beginning of Bleak House, the marshes in Great Expectations  with the hulks looming in the distance. Tolstoy considered Chapter 55 of David Copperfield ('Tempest') to be that by which all other fiction should be measured. Other popular works such as Nicholas Nickleby  and A Tale of Two Cities  are available online as free eBooks.